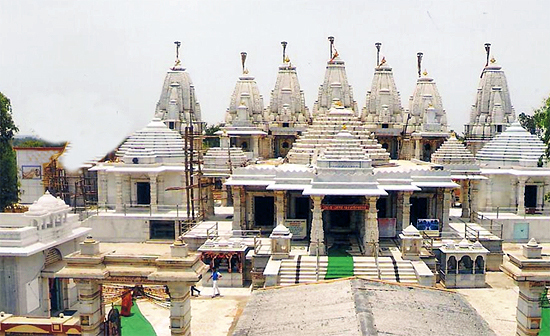 Manibhadra Veer Temple is on the right side pedestal of the main temple. He stands as a protector of the devotees and guards the Shrine. His blessings can be achieved through the ceaseless recitation of NAVAKAR (Moot Mantra) and Jai Jinendra (Glory to the Lord). Prayer for self and prasad (SUKHADI) for others is inspired here. Shri Nathmal Banaji is originally from koshorav(raj.) presently stays at Mumbai, has given his graceful support for constructing Shri Manibhadraveer Temple. It was inaugurated by Param Pujya Acharyadev Shri Rajyashsvrishwarji ma.sa. in the presence of Kanchan Ben Pranlal Doshi of Mumbai. In same temple Puniya Baba of Osvanshastidhyak was placed by Shri Shantilal Golcha Durg. Idol of Shri Nakdo Bharuji by Hulasmal Chandanmal Modi of Rajnandgaon and Bhilai Bhomiyaji was placed by Maniben Amritlal Jsinglal of Mumbai. This Temple’s inauguration was guided by pa.pu. Acharaya Bhagwant Shrimad Vireshansurieshwarji ma.sa. and done by Dhulchand Duggad of Rajnandgaon. Idols of shri Manibhadraveer was filled by smt. Narangiben Khantilal d. Shah of andhri Mumbai, shri Puniya baba by Shantilal Golcha & fa.Durg and Nakodabahuru by Nathmalmunnilal Bhandari tavastgarh(raj) of Mandya (Kar.). Tirth’s upashraya was filled by Sanghvi Dungarchand Myachand (koshwal Raj.) of Nelloure (A.P.). Idol of shri Manibhadraveer was placed by Metha of Nagpur. This area is filled with great blessings of Manibhadraveer. Thousands of devotees who worship holy spirit of shri Jineshwer and shri Manibhadraveer are blessed by them.. In the 32nd deeksha varsh of pa.pu.a. Shri Rajyashsvrishwarji ma.sa devotees are placing tirth in temple. In the construction of this temple help of Shi Ghasulal Badmiya Mumbai, Shri Kuvarlal Duggad Dhamtari, Pattni Opticals Mumbai, Manilal Purushtom Bhai Shah Ahmedabad is very appreciated. Appreciated artwork of glass and picture of tirth patt and was donated by Jai Mahveer parivar karad for the Ghhambhra of temple Temple of Raj Rajeshwer Maa Baghwati Shri Padmavati Devi. In Shri Uwassaggaharam Parshwa Tirth Temple of Raj Rajeshwer Maa Baghwati Shri Padmavati Devi. Was placed by Kesarchand Kothari Durg under guidance of pa.pu. Acharyadev Shri Varichansurieshwerji ma.sa. परम उपकारी कविकुलकिरीट महाबसंत सूरिदेव दिव्य आषीषदाता प.पू. श्रीमद् विजय लब्धिसूरीश्वरजी म.सा. तीर्थ प्रभावक आषीषदाता आचार्य भगवंत प.पू. श्रीमद् विजय विक्रमसूरीश्वरजी म.सा. तीर्थ पति संबंधित दस्तावेजों के साक्षात्कार प.पू.पं. श्रीमद् अभयसागरजी म.सा. तीर्थोद्धार मार्गदर्षक प्रतिष्ठाचार्य प.पू. आचार्य भगवंत, प्रज्ञापुरुष श्रीमद् राजयशसूरीश्वरजी म.सा. तीर्थोद्धार मुहूर्त प्रदाता पूज्य पाद आचार्य भगवंत श्रीमद् विजयरामचंद्र सूरीश्वरजी म.सा. तीर्थ के रचनाकार साधुता के स्वामी प.पू. श्रीमद् कैलाससागर सूरीश्वरजी म.सा.